Background and objectives Little is known about the optimal echocardiographic parameters for risk stratification in stable dialysis patients with preserved left ventricular ejection fraction (LVEF) (ejection fraction ≥50%). Left ventricular (LV) global peak systolic longitudinal strain (GLS) is the ratio of the maximal change in myocardial longitudinal length in systole to the original length and reliably and accurately assesses LV function. During systole, LV myocardium in the longitudinal direction shortens and GLS is represented by a negative value. The more negative value of GLS, the better the LV function is. This study hypothesized that subtle abnormalities of GLS are associated with an adverse prognosis. Design, setting, participants, & measurements This prospective study collected clinical and echocardiographic data (including GLS) from 88 stable hemodialysis patients (mean age 67.0±11.2 years; 35% men) with preserved LVEF. These patients were enrolled from December 2008 to January 2009 and were followed-up for 25.6±9.9 months. The primary outcome was all-cause mortality. Multivariate Cox regression analysis was used to investigate risk factors for mortality. Results The mortality group (n=24) had lower albumin levels, less negative GLS, and higher prevalence of coronary artery disease and diabetes mellitus than the survival group. Using a GLS cutoff value of −15%, the less negative GLS group (GLS ≥−15%) had a higher mortality rate. Cox regression analyses revealed that lower albumin level (hazard ratio, 0.16; 95% confidence interval, 0.05 to 0.53; P=0.003) and less negative GLS (hazard ratio, 3.57; 95% confidence interval, 1.41 to 9.04; P=0.01) were independent predictors of all-cause mortality. Furthermore, less negative GLS was associated with a higher cardiovascular death rate. Conclusions Less negative GLS is predictive of poor prognosis among stable hemodialysis patients with preserved LVEF. Despite significant advances in dialysis, the high mortality of ESRD patients is an important and unresolved issue. Identifying the high-risk patients could allow physicians to optimize therapeutic interventions, which may lower morbidity and mortality (1). Heart failure (HF) is one of the most frequent cardiac complications in ESRD patients. Left ventricular (LV) systolic dysfunction, defined by low LV ejection fraction (LVEF), is associated with poor prognosis (2–4). However, abnormal LV functions, as recognized by conventional echocardiography, may identify only dialysis patients with established cardiovascular disease (5–7). Neither aggressive medical treatment nor multiple intervention strategies are proved to improve prognosis in ESRD patients (6,7). This lack of documented efficacy may be attributable to the fact that interventions are studied at disease stages at which severe structural and functional changes have been established. Cardiac functions in ESRD patients have been studied extensively by conventional echocardiography, which merely provides semiquantitative evaluation and cannot detect subclinical cardiac dysfunction (8). Although LV hypertrophy (LVH) and reduced LVEF are recognized as prognostic predictors in dialysis patients, most ESRD patients have LVH and preserved LVEF (ejection fraction ≥50%) (1,9,10). Therefore, a more promising method to evaluate cardiac functions is critical. Deformation (strain) is the fractional change in an object’s dimension compared with the object’s original dimension. LV global peak systolic longitudinal strain (GLS), obtained from two-dimensional speckle-tracking echocardiography with strain analysis (Figure 1), is the ratio of the maximal change in myocardial longitudinal length in systole to the original length. During systole, LV myocardium in the longitudinal direction shortens and GLS is represented by a negative value. The more negative value of GLS, the better the LV function is. Compared with LVEF, GLS is a more sensitive, objective, and reproducible modality for assessing cardiac functions, even among HF patients with preserved LVEF and CKD patients (11–14). In the general population, GLS has proven to be a prognostic predictor (13,14). Reports suggest that subclinical LV systolic dysfunction, as indicated by GLS, is present in CKD and ESRD patients (8,12,15). However, there are few data on the prognostic role of GLS in hemodialysis patients. Thus, we conducted a prospective observational study to assess the prognostic role of GLS in stable hemodialysis patients with preserved LVEF. Processing and presentation of GLS. Values of the peak systolic longitudinal strain from the apical long-axis, apical 4-chamber, and apical 2-chamber views were obtained from automated function imaging software. (A) Tracking quality approval screen: segments with adequate tracking are shown with a V mark. (B) The average value of peak systolic longitudinal strain in each segment calculated from three apical views was used to generate a parametric display, named GLS. GLS, left ventricular global peak systolic longitudinal strain; basSept, basal septum; midSept, midseptum; apSept, apical septum; apLat, apical lateral wall; midLat, midlateral wall; basLat, basal lateral wall; ANT_SEPT, anterior septum; ANT, anterior; LAT, lateral; POST, posterior; INF, inferior; SEPT, septum; GLPSS, global longitudinal peak systolic strain; LAX, apical long-axis; A4C, apical 4-chamber; A2C, apical 2-chamber; Avg, average; HR_ApLAX, heart rate apical long-axis; AVC_MEAS, measured aortic valve closure timing. 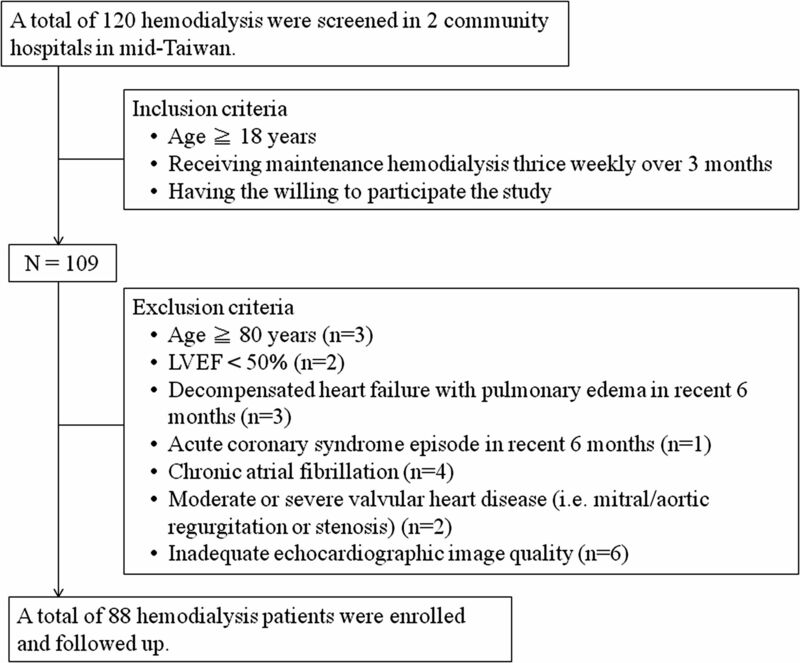 ESRD patients receiving a maintenance hemodialysis program, thrice weekly over 3 months, were prospectively screened from two community hospitals in Yun-Lin, Taiwan (National Cheng Kung University Hospital Dou-Liou Branch and Catholic Fu-An Hospital) (16). Patients who were aged ≥18 years and willing to participate in this study were enrolled from December 2008 to January 2009. The exclusion criteria were as follows: (1) age >80 years, (2) LVEF <50%, (3) HF that was diagnosed by the HF guideline criteria from the European Society of Cardiology (17) presenting with pulmonary edema in the past 6 months, (4) acute coronary syndrome in the past 6 months, (5) chronic atrial fibrillation, (6) moderate or severe valvular heart disease (including mitral/aortic regurgitation or stenosis), and (7) inadequate echocardiography imaging quality. The study adhered to the Declaration of Helsinki and received approval from the Human Research and Ethics Committee of National Cheng Kung University Hospital (institutional review board numbers: ER-97-183 and ER-98-073). All enrolled patients provided written informed consent. Clinical information on comorbidities, medical history, and current cardiovascular medication was obtained by careful review of each patient’s medical record and a self-reported questionnaire. Patient compliance with prescribed medication regimens was reliably ascertained. The enrolled patients’ medical records during the follow-up period (December 2008 to June 2011) were carefully reviewed, and all participants were assured to receive adequate clearance by dialysis. The primary outcome was all-cause mortality. The secondary outcomes were major adverse cardiovascular events (MACEs), such as cardiovascular death; ischemic events, including admission due to angina and coronary revascularization; and HF hospitalization. The definition of MACEs is presented in Supplemental Table 1. Blood was collected immediately before the midweek dialysis session. Sera were stored at −80°C until analysis and then thawed to measure the levels of cardiac troponin T (cTnT) (fourth-generation Troponin T STAT immunoassay, ElecSys 2010 System; Roche Diagnostics, Indianapolis, IN), high-sensitivity C-reactive protein (BN II analyzer; Dade Behring, Glasgow, DE), IL-6 (chemiluminescent sandwich ELISA, Quantikine Human IL-6; R&D Systems Inc., Minneapolis, MN), and plasminogen-activator inhibitor type 1 (PAI-1) (Human PAI-1 ELISA Kit; Assaypro, St. Charles, MO). Serum calcium, phosphate, and albumin levels were measured using routine methods. All of the patients were examined in the left lateral decubitus position by one well trained cardiologist (Y.W.L. ), using an ultrasound system with a 3.5-MHz probe (Vivid-i; GE Healthcare, Horten, Norway). As previously described, all hemodialysis patients received an echocardiographic examination during the halfway point of the hemodialysis session (the second or third hour of each session) (12). According to the recommendations of the American Society of Echocardiography (18), quantifications of LV mass index (LVMi), LVEF, and left atrial volume index (LAVi) were performed, and LVH was defined as LVMi >115 g/m2 for men and >95 g/m2 for women. Pulse tissue Doppler imaging velocities were acquired at the septal and lateral mitral annuli, including the peak systolic (s’) and early diastolic (e’) velocities. The ratio of early transmitral flow to early diastolic mitral annular velocity (E/e’) was calculated from the average of the septal and lateral e’. Two-dimensional grayscale imaging in three standard apical views (i.e., apical 4-chamber, apical 2-chamber, and apical long-axis) for three cardiac cycles were acquired and stored digitally with a frame rate of 50–90 frames per second for subsequent off-line analysis (11,12). To evaluate the fluid status of hemodialysis patients, the inferior vena cava (IVC) diameter was measured twice at the end of expiration in a sub-xiphoid location (12,19), and the average of the measured end-expiratory IVC diameter was defined as IVCe. Using automated function imaging software (EchoPAC work station, BT09; GE Healthcare, Tirat Carmel, Israel), off-line image analysis was performed by two cardiologists (Y.W.L. and W.C.T.) (blinded to the patients’ clinical information). Strain and strain rate were measured using the following protocol (11,12,16): (1) GLS and longitudinal systolic strain rate were automatically obtained from the three standard apical views, and (2) six LV segments on the parasternal short-axis view at the midpapillary level were examined to obtain the circumferential strain and strain rate in systole. Continuous data are presented as the means ± SDs, and dichotomous data are presented as numbers and percentages. Comparisons were conducted using the t test and nonparametric test for continuous variables that are and are not in normal distribution, respectively. The chi-squared test or Fisher’s exact test was used for categorical variables, where appropriate. The relationships among continuous variables were analyzed by Pearson correlation analysis. Logistic regression analysis was performed to determine the independent factor of GLS. The Kaplan–Meier method was used with a log-rank test to compare survival rates between strata. Univariate Cox regression analysis was performed to evaluate factors in relation to all-cause mortality and cardiovascular death. Factors with P<0.10 on univariate analysis were considered in the multivariate Cox regression analysis to investigate risk factors of mortality. Intrarater and interrater reliabilities were assessed for the measurement of GLS in two sets of 20 randomly selected participants using Bland–Altman analysis of agreement and the interclass correlation coefficient. A two-sided P<0.05 was considered statistically significant. All statistical analyses were performed using the SPSS software package (version 17.0; SPSS Inc, Chicago, IL). We prospectively screened 120 ESRD patients receiving a maintenance hemodialysis program from two community hospitals. According to the inclusion and exclusion criteria (Figure 2), 88 patients were included in the final analyses. The adequacy of dialysis was evaluated based on the recommendations of the Kidney Disease Outcomes Quality Initiative. All patients presented with anuria and received an adequate dose of hemodialysis (average Kt/V, 1.71±0.23; hemoglobin, 10.2±1.2 mg/dl; cardiothoracic ratio on chest x-ray, 52%±5%). Inclusion and exclusion criteria. LVEF, left ventricular ejection fraction. No patient was lost to follow-up during the study period. Twenty-four patients (27.3%) died: 9 from cardiovascular death, 11 from infections, and 4 from liver diseases. The enrolled patients were stratified into two groups: survival and mortality (Table 1). There were no significant differences in IL-6 and PAI-1 levels between these two groups. The mortality group had a higher rate of prevalent coronary artery disease (CAD) and diabetes mellitus and higher cTnT levels but had lower albumin levels (Table 1). LV end-diastolic volume index and IVCe were used to assess patient volume status (Table 1) (12,16,19). There were no differences in these measurements between the study groups, and IVCe was not engorged in either group. These data indicated that the patients in these two groups were not overhydrated. Eighty patients (91%) presented LVH (18). The survival and mortality groups had a reverse ratio between early and late LV filling velocity, high E/e’, and a high LAVi, which were consistent with diastolic dysfunction (Table 1). Strain and strain rate were analyzed by automated function imaging software. Compared with the survival group, LVEF and s’ were not reduced in the mortality group but GLS was significantly less negative (Table 1), which indicated subclinical LV systolic dysfunction in the mortality group. Furthermore, we performed Pearson correlation analysis between GLS and other continuous measures and found that LVMi, cTnT level, LVEF, s’, IVCe, and LAVi significantly correlated with the deterioration of GLS (Supplemental Table 2). We performed linear regression analysis of these factors and found that cTnT level was the only significant factor associated with GLS (coefficient = 0.57; P<0.001). The mean and median cTnT concentrations for the enrolled patients were 0.045 ng/ml and 0.03 ng/ml, respectively. On the basis of previous studies (13,16,20), the cTnT cutoff point was defined as 0.03 ng/ml. The high-cTnT group (cTnT >0.03 ng/ml) showed deteriorated LV systolic function, presenting with less negative GLS (Supplemental Figure 1). Several studies have demonstrated that GLS ≥−15% should be considered pathologic (21–23). Therefore, we defined the cutoff point of GLS as −15%. All of the enrolled patients were then stratified into two groups (Table 2): the less negative GLS group (GLS ≥−15%, n=15) and the more negative GLS group (GLS <−15%, n=73). The less negative GLS group had a higher rate of prevalent CAD and increased cTnT level. Although the IVCe diameter of the less negative GLS group was larger than that of the other group, the IVC was not engorged in the less negative GLS group and there was no significant difference in LV end-diastolic volume index between these two groups. As a result, these data indicated that the patients in these two groups were not fluid overloaded. With the cutoff values of 0.03 ng/ml for cTnT and −15% for GLS, the Kaplan–Meier survival curves demonstrated significant differences in terms of all-cause mortality (Figure 3, A and B). Interestingly, the cardiovascular mortality rate was significantly higher in asymptomatic hemodialysis patients with GLS ≥−15% (Figure 3, C and D, and Table 3). Moreover, there was no significant difference in other MACEs endpoints (e.g., admission due to HF, angina admission, and revascularization) between these two GLS groups (Table 3). Increased cardiac troponin T (cTnT) level and less negative left ventricular global peak systolic longitudinal strain (GLS) were associated with increased all-cause moratlity rate in asymptomatic hemodialysis patients (A and B). Only less negative GLS, but not cTnT, was associated with higher cardiovascular (CV) death rate (C and D). Using univariate Cox regression analysis, hypertension, prevalent CAD, diabetes, log cTnT, serum albumin level, and less negative GLS were significantly associated with outcomes (Table 4). However, because there were only 24 patients reaching the primary outcome, many covariates in the multivariate Cox model might result in an unstable estimate. CAD is associated with an increased risk of mortality in asymptomatic hemodialysis patients (24), and two nationwide studies from Japan and Taiwan demonstrated the prognostic role of diabetes mellitus in hemodialysis patients (25,26); therefore, hypertension, diabetes mellitus, prevalent CAD, log cTnT, and GLS were thus included for multivariate Cox regression analysis (Table 4). However, because of the significant association between GLS and cTnT level by Pearson correlation analysis and linear regression analysis, we did not include serum cTnT level and GLS in one multivariate Cox regression model. Using multivariate Cox regression analysis, hypertension, diabetes mellitus, albumin level, and less negative GLS were independent prognostic predictors (Table 4). Because the ESRD patients received echocardiographic examination during hemodialysis, we wondered whether hemodialysis affects GLS. We performed echocardiography twice for 10 of these patients: during hemodialysis and on a nondialysis day. There was no significant difference of GLS during hemodialysis versus a nondialysis day (−17.0%±5.8% versus −16.6%±5.8%, respectively; P=0.87). Bland–Altman analysis revealed no systemic bias of GLS between intrarater and interrater agreements (Figure 4). The intrarater and interrater correlation coefficients of the average measures for GLS were 0.99 (95% confidence interval, 0.97 to 0.99) and 0.96 (95% confidence interval, 0.90 to 0.98), respectively. The mean (±SD) intrarater and interrater differences for GLS were −0.21±0.94 (95% limits of agreement, −2.05 to 1.63) and 0.44±1.48 (95% limits of agreement, −2.46 to 3.34), respectively. Bland–Altman analysis showed no systemic bias of left ventricular global peak systolic longitudinal strain (GLS) between intra- and inter-rater agreements. (A) intraobserver and (B) interobserver variability of left ventricular GLS. This is the first study to demonstrate that GLS is a prognostic predictor of all-cause mortality in stable hemodialysis patients with preserved LVEF. We showed that less negative GLS (GLS ≥−15%) was the independent predictor of all-cause mortality and those patients with less negative GLS had a higher cardiovascular mortality rate. Thus, we highlighted the clinical application of GLS for risk assessment in clinically stable hemodialysis patients with preserved LVEF. In this study, the echocardiographic parameters did not differ between the mortality group and the survival group, except for GLS. In the nondialysis population, GLS is proved as a more reliable and sensitive parameter for representing LV systolic function in patients with cardiomyopathies, advanced-stage CKD, or HF with preserved LVEF (11,12,27–30). Less negative GLS is also proved as a powerful predictor of all-cause mortality in the general population (9), and is reported to be useful in the preclinical diagnosis of a number of other cardiomyopathies, including diabetes, hypertrophic cardiomyopathy, and amyloidosis (28–30). In these cardiomyopathies, only GLS precedes any clinical evidence of overt systolic dysfunction, suggesting that abnormal GLS may represent an early stage of abnormal LV geometry and function. It is feasible that abnormal GLS is the precursor of overt uremic cardiomyopathy in dialysis patients. The mechanisms of abnormal GLS in ESRD are not fully clear, but may reflect interstitial fibrosis with myocyte hypertrophy (31). Furthermore, less negative GLS may be also associated with microvascular ischemia caused by the reduction in the density of myocardial capillaries, myocardial fibrosis, or hemodialysis-related myocardial stunning (32–35). Nevertheless, GLS is a reliable and early parameter to detect myocardial abnormalities such as fibrosis or ischemia, which often precede overt systolic dysfunction (9,19,20). Because myocardial abnormalities in ESRD patients may lead to poor prognosis, this might explain the predictive value of GLS for long-term prognosis in stable hemodialysis patients with preserved LVEF. Our results showed a significant association between less negative GLS and increased cTnT concentration in ESRD patients. The high-cTnT group had deteriorated LV systolic function, represented by less negative GLS (Supplemental Figure 1). The prognostic value of cTnT in ESRD patients is well established and clearly associated with cardiac structural and functional abnormalities (1,9). However, an elevated cTnT concentration has not been proved as an outcome predictor in ESRD patients having preserved LVEF. This study showed that those stable hemodialysis patients having preserved LVEF and an elevated cTnT level had a higher all-cause mortality rate. Our data were consistent with the results reported by Wang et al. (36), which suggested that an elevated cTnT level was a important risk factor in the dialysis population. The significant association between GLS and cTnT level might reflect that they may, at least in part, share common mechanisms (e.g., myocardial injury, interstitial fibrosis, myocyte hypertrophy) and result in poor outcomes. Due to the small sample size and a significant association, we did not include these two factors (GLS and cTnT) in one Cox model so we could not identify which one is more powerful in predicting all-cause mortality; however, GLS, rather than cTnT level, was clearly significantly associated with cardiovascular mortality (Figure 3 and Table 4; Supplemental Table 3). Nevertheless, it is worth mentioning that measuring GLS is reproducible and noninvasive compared with the cTnT assay. In addition, speckle-tacking echocardiography with GLS analysis provides more information to assess cardiac functions in ESRD patients. Among the general population, less negative GLS and LVH are proved as prognostic predictors and less negative GLS is frequently detected in LVH patients; however, there is no study to compare the prognostic value of GLS with that of LVH. In addition, most hemodialysis patients have LVH, which may limit the clinical application of LVH to predict prognosis. Our study showed similar results in that most of the enrolled hemodialysis patients had LVH; importantly, we demonstrated significant prognostic value of GLS in such patients. Because conventional echocardiographic parameters are related to volume change, GLS causes concern about the effect of body fluid load in hemodialysis patients. We showed that there was no difference in GLS of ESRD patients during the halfway point of the hemodialysis session and on a nondialysis day. Furthermore, recent studies proved that GLS is not affected by load manipulation (12,37). This study has some limitations. First, although less negative GLS was not associated with revascularization and hospitalization due to HF or CAD during the follow-up period in our study population, we recognized that because of the relatively small numbers of the studied patients, this study had reduced observational power for identifying differences in binary outcomes such as MACEs between the groups. Second, some dialysis patients had severe valvular heart diseases, atrial fibrillation, or poor echocardiographic image quality, which excluded the possibility of GLS analysis. Third, all of the enrolled patients received long-term hemodialysis and presented with anuria. We recognize that the enrolled patients do not represent generalized hemodialysis patients and, therefore, caution is needed if applying our results to the overall hemodialysis population. Finally, we did not measure brain natriuretic peptide (BNP) levels in this study. Although emerging evidence indicates the clinical applications of BNP in ESRD patients, BNP cannot replace echocardiography for the evaluation of cardiac functions and cardiovascular risk profile in ESRD patients. More importantly, echocardiography can provide more information than BNP levels. Among asymptomatic hemodialysis patients with preserved LVEF, less negative GLS is predictive of poor prognosis. The use of GLS would allow the early identification of high-risk ESRD patients. These findings indicate that less negative GLS may provide a marker or target for specific treatment strategies and demonstrate the explicit application of GLS in clinical practice. This work was supported by the National Science Council, Executive Yuan, Taipei, Taiwan (NSC 98-2314-B-006-051). This article contains supplemental material online at http://cjasn.asnjournals.org/lookup/suppl/doi:10.2215/CJN.10671012/-/DCSupplemental.